We’d love your help. Let us know what’s wrong with this preview of Enigma Tales by Una McCormack. Elim Garak has ascended to Castellan of the Cardassian Union...but despite his soaring popularity, the imminent publication of a report exposing his people's war crimes during the occupati From the New York Times bestselling author of The Fall: The Crimson Shadow comes a compelling and suspenseful tale of politics and power set in the universe of Star Trek: Deep Space Nine. To ask other readers questions about Enigma Tales, please sign up. As far as I'm concerned, Una McCormack should be the only author allowed to write for Elim Garak and the Cardassian Union...she never fails to grasp the threads of a story, and spin them into fibers of gold. This is beyond excellent -- this is sublime "Star Trek", and in its complexity and brilliance, another example of what a gift DS9 and its universe was to the wider world. Simply breathtaking from start to finish. Una McCormack not only gets Star Trek as it is, capturing characters such as Elim Garak and Katherine Pulaski and peoples such as the Cardassians with pitch-perfect clarity, but she also gets Trek's potential to say meaningful things about subjects that are all too relevant to our world today. Her grasp of history, culture, and the complexity of big moral questions is showcased here. Garak, like Cardassia, is trying to rebuild and rise above the violence of the recent past, but he -- like his pe Una McCormack not only gets Star Trek as it is, capturing characters such as Elim Garak and Katherine Pulaski and peoples such as the Cardassians with pitch-perfect clarity, but she also gets Trek's potential to say meaningful things about subjects that are all too relevant to our world today. Her grasp of history, culture, and the complexity of big moral questions is showcased here. Garak, like Cardassia, is trying to rebuild and rise above the violence of the recent past, but he -- like his people, like their state -- is defined by a history and context that must be grappled with, not ignored. Enigma Tales is a thoughtful and moving exploration of how cultures (and individuals) can come to terms with and begin to put right the mistakes of their pasts. (Something that’s also true of the author’s other works about Cardassia, which form a loose series within the larger Star Trek tie-in novels universe). The story touches on the different ways Cardassians deal with their guilt about the past, the role that literature can have in rebuilding and redefining a culture, the fight between those Enigma Tales is a thoughtful and moving exploration of how cultures (and individuals) can come to terms with and begin to put right the mistakes of their pasts. (Something that’s also true of the author’s other works about Cardassia, which form a loose series within the larger Star Trek tie-in novels universe). The story touches on the different ways Cardassians deal with their guilt about the past, the role that literature can have in rebuilding and redefining a culture, the fight between those who want to make a new Cardassia and those who want to restore the old one, the importance of memory and honesty, and the part academic institutions have to play in this process. It’s an incredibly compelling story shot through with humour and warmth. Highly recommended. Loved this book, Una McCormack is a must for Elim Garak fans she not only gets his character just right but takes you deep into his psyche. It doesn't stop there though, there is a understanding of the world and all main characters that make you want more. Elim Garak as the head of state for Cardassia? That stretches credulity for me (although I admittedly haven't read any of the other post-show DS9 books, so I don't know how he got there). Still, this is 350 pages of Garak at his most Garakesque, so one can't complain too much about that, even if it means putting up with Katherine Pulaski for an entire novel. The main plot was enjoyable, as well. Castellan Garak is in the process of rebuilding Cardassian society in the wake of the crimes committe Elim Garak as the head of state for Cardassia? That stretches credulity for me (although I admittedly haven't read any of the other post-show DS9 books, so I don't know how he got there). Still, this is 350 pages of Garak at his most Garakesque, so one can't complain too much about that, even if it means putting up with Katherine Pulaski for an entire novel. The main plot was enjoyable, as well. Castellan Garak is in the process of rebuilding Cardassian society in the wake of the crimes committed during the Bajoran occupation and the Dominion War, and in doing so has to look at the role that truth and reconciliation play as part of that rebuilding. Like all good Star Trek, it's a fundamentally human story, one that could find a great deal of echoes in our history. No one writes Cardassian politics, or Elim Garak, as well as Una McCormack. Enigma Tales is a mystery/spy novel set in a familiar science fiction universe. With smart, dimension-ed characters that move the story forward, without spoiling the mystery. The story is set on the world of Cardassia Prime. Recovered from a war that left billions dead. The society has turned introspective, trying to come to terms with and atone for its' past crimes. Journeying to the planet for the first time is Dr. Katherine Polaski. A Starfleet doctor invited to the planet to be honored for he Enigma Tales is a mystery/spy novel set in a familiar science fiction universe. With smart, dimension-ed characters that move the story forward, without spoiling the mystery. The story is set on the world of Cardassia Prime. Recovered from a war that left billions dead. The society has turned introspective, trying to come to terms with and atone for its' past crimes. Journeying to the planet for the first time is Dr. Katherine Polaski. A Starfleet doctor invited to the planet to be honored for her Medical work, along with her friend and former-spy Peter Alden. Add to this a dash of plucky-assistant, a historical researcher, an eminent literary professor, the local police chief, and the former spy-turned interstellar leader: Elim Garak. All these elements combine to form a mystery, not unlike tales told by the Cardassians themselves, where perhaps everyone is guilty? I liked the setting and society Ms. McCormack puts forward in the novel. The closest real-world analogy would seem to be West Germany in the latter half of the 20th century. A place rebuilt through hard work, but then actively engaged in studying its' past to ensure as not to repeat it. She demonstrates the best virtues of an actively engaged democracy and right to free expression. The mystery of the novel is revealed slowly and much like the character of Garak from the show, never all at once, and not in a neat little package. The author does a great job walking the line of feeling guilt with the characters. Letting them be motivated by it, rather than destroyed or becoming withdrawn as a result of it. I almost expected some thinly veiled name resembling Fox News to appear and completely spoil the narrative. I would have preferred that rather than hearing this, or only hearing this, that we were shown something as well. This is a great book. I devoured it. I recently finished re-watching the full DS9 series on Netflix and have been looking for ways to fill the DS9 hole in my life. This book was perfect. I've not read a book by Una McCormack before, but after reading this one I plan to seek out her other Star Trek novels. What I appreciated most while reading this book is how she nailed the characters; two in particular: Elim Garak and Dr. Katherine Pulaski (from Star Trek: The Next Generation). Garak is one of my This is a great book. I devoured it. I recently finished re-watching the full DS9 series on Netflix and have been looking for ways to fill the DS9 hole in my life. This book was perfect. Garak is one of my favorite characters from the DS9 cast. This book takes place about 10 years after the show's finale. It was a lot of fun to find out what Garak is up to. But more than that, he's a character rich with mystery. He has a jaded, ugly history. He often speaks with measured responses that are full of subtext. He's a master manipulator (when he wants to be) and also a warm-hearted friend. He's a trained killer and also a man of principle. I think Garak would be a tricky person to write, and that McCormack did so wonderfully. Spot on, in fact. Dr. Pulaski is someone I sort of enjoy disliking. (I think a lot of Trek fans feel that way about her.) She's not likable, nor is she a villain. She's pushy and brash, but on the right side of things, usually. She's not Bones or Dr. Crusher -- knights in shining armor in their own ways. She's more like a loudmouthed and opinionated relative -- someone who will predictably cause trouble when everyone gets together. Like Garak, I think it would be difficult to write her well, but the character came through clearly and truly. I often think Star Trek episodes are best when they do two things: (1) involve believable character drama; (2) tackle a difficult issue somehow. I honestly didn't expect this book to tackle an issue, but it did. Throughout the reading various real-life issues were brought to mind. Things like: war crimes, statutes of limitation, culpability, racism, hate, unity, the role of religious beliefs in one's identity, and even the need for counseling. While none of these things were unpacked and discussed completely, the end result is a sci-fi story rich with believable themes. Another winner in Una McCormack's catalog! She has crafted a compelling story that goes, at times, to some very dark places, but that is offset by a great sense of humor. McCormack captures the voices of the characters magnificently, especially Garak, which is no surprise. McCormack has become a master of writing for the enigmatic Cardassian tailor/spy/leader of Cardassia! **As per all of my reviews, I like to preface by saying that I listened to this book in audiobook format. This does indeed slightly skew my rating. I have found that audiobooks, give me a better "relationship" with the characters if done well, but also kills the book for me if narrated poorly. Also due to the nature of listening to the text, names and places may be spelled incorrectly here as I often do not have the physical volume in front of me. Also, I have written this review in a "rolling u **As per all of my reviews, I like to preface by saying that I listened to this book in audiobook format. This does indeed slightly skew my rating. I have found that audiobooks, give me a better "relationship" with the characters if done well, but also kills the book for me if narrated poorly. Also due to the nature of listening to the text, names and places may be spelled incorrectly here as I often do not have the physical volume in front of me. I've always liked Garak, since my watch though of DS9…which I'm not done with yet. But I soon become a bit fascinated by the Cardassians, as they were heavily featured in the DS9 tv show. They had a very mysterious, 'business behind closed doors' feel to them, and their relationship with Bajor…and their role in the Dominion War was fascinating. So I was excited to see the book in the sort of "new quasi canon" book line of Star Trek books that deals with Garak and the Cardassian homeworld. To start off with, I love idea of Cardassian "Enigma Tales". Basically these are popular murder and crime novels that usually always end up with the character being guilty of the crime. This was introduced in DS9, much to Bashir's puzzlement. But Garak explains that it's not if the character is guilty, but rather how and why is the what is the intrigue. And heck Julian Bashir seems to be in it! Enigma Tales opens with a letter from Garek to Bashir, stating how he wished the doctor could have come to Cardassia earlier, but was glad he didn't in that he didn't want to him to see Cardassia in it's low point. Cardassia Prime and it's other worlds felt the collapse of their mini empire especially hard. Poverty seemed to run rampant. Cardassia awas a very strict, regimented, I wouldn't say War like, but very… government NSA Big Brother type society. When we watch movies like V For Vendetta and read 1984, Cardassia jumps to mind. They value the idea of loyal to the "family unit" and the state. So that right there already paints a picture in my mind that makes me drool with dystopian lust. The two of them arrive, and meet with their Cardassian "tour guide" who humoursly seems to be a Cardassian apologist. He's pretty much tripping over himself to appease them and make them as welcome as possible. He goes out of his way to make sure they know that Cardassia has changed and isn't up to it's older methods of gov't. Antok, who seems to be a Bajorian historian, is enjoying the fact that Cardassian in it's new form of gov't has become fascinated with news, and looking back and reflecting on their history. She too works at the University of the Union (U of U) like Lang. She respects Lang it seems. After they find out the head of the university is stepping down and retiring, it seems like she feels Lang would be a good fit for a replacement. Seems odd that a Bajorian would be respected in a Cardassian school, even with their new outlook! Very cool though, she's 1/4 Bajorian apparently, her mother brought to Cardassia for the lusty wants of a Gul at the time. Antok looks Cardassian. So bingo, no one at this point even knows she's actually of Bajorian blood….she wonders if anyone would still care…She goes to pick up her 1/8th Bajorian kids…and her husband Miikor, is completely Cardassian. Garak's Chapter, he has become Castellan of Cardassia. Despite the burden, Garak actually seems to enjoy his role as Castellan. He seems to be surrounded by overtly positive "yes men" who drench him in praise and congrats. And applaud him for all his decision, declaring it's a new golden age since he's been elected. Also and most worringly, Julian Bashir seems to be in the same building as Garak, but described as "lost" and 'not there". In some form of canatonic state? Julien was a great mind, would be a shame for him to be broken..Garak seems remorseful about this when his aide brings it up..
Garak is visited by the Legets (generals) of Cardassia and pretty much threatened that if he doesn't dismiss this report coming out that they will expose his past crimes. They fear, as does he, of being prosecuted by the new, freer, more transparent Cardassia. Dr. Pulaski has a few interviews lined up before her ceremony, and one such is a televised "Morning" show style interview that takes her by surprise in how heavy the questioning is. She's asked about her thoughts on the vacancy of the Head of Academia at U of U. This implies that this "dean" position is pretty important to all of Cardassia. The gov't is quite used to having heavy roots and ties with academic life, so this isn't surprising. After being pressed she finally begins raving out her own opinions. The interviewer then breaks upon her the question of the bill presented to force the courts to try and prosecute the war crimes of the Cardassian military. This is really interesting stuff, and this is quite obvious but very provocative comparison and analogy to the Nuremberg trials of post WWII Germany. This bristles Garak, who up to this point we know may have had a quite questionable back ground during the Bajorian occupation, but we don't know the full extent of what he committed. Now as Castellan he's under more pressure. He's being advised by many of his aids to end this as soon as possible. Meanwhile we're introduced to another character, Elima Antok. She is half Cardassian and half Bajorian. Her husband is full Cardassian. She works as a researcher in the U of U, and while working comes across an old file that was restored from almost complete destruction from the Jem'hadar bombing of university. It's interesting that after a decade, they're still finding and piecing together files, and data from the wreckage. She's able to restore the disk and see it's contents and it's labeled as secret project "Project Enigma". Antok seems intriguing. She's of half Bajorian lineage, and while the planet of Cardassia has a much more open society, she still keeps this fact hidden. Her kids as well, as she doesn't want to attract attention. She's clearly Cardassian enough in appearance were she can pass for one. Unfortunately it's described that they must practice their religion in secret. As most Cardassians don't really subscribe to religion, it would be very very out of place if they were to do so openly. Reading more into the lovely and deeply detailed lore on Cardassia, I'd almost venture to say that this book is almost required reading for anyone interested in the Cardassian race. It goes far into the psyche of just how the Cardassian people think. Even so far as just learning more and more about Garak, who's character I would consider to be one of the deepest and most complex in all of Star Trek…During another unsent letter to Bashir, Garak relates that he has read a great deal of early human history including Roman, and WW2 era warfare. He actually went to Earth and lived in Paris for a while and viewed much of Germany, France and England. He unabashedly relates earlier Cardassia to WW2 era Germany. He relates that as Cardassia tries to turn itself around rebuilt new offices and govt buildings, while still purely Cardassian, took a redesigned more "open" approach. There is a very VERY noticeable implication that Garak has such a fondness for Bashir that it borders on what we would deem homosexual. He has made it abundently clear that he has a true love for Bashir that seems to go beyond a doctor/patient relationship. Meanwhile the beloved by all Kitty Pulaski is giving her speech to the medical community on Cardassia. The author really is putting Pulaski through the wringer in terms of flaws. I mean I really enjoy a flawed, and non "sterile" character as much as the next guy, but Pulaski really comes off as unlikable. I enjoy this and I feel as though it's a very rare trait in female characters. It's almost as writers are afraid to make female characters flawed or else they'll be disliked. And don't mean disliked the same way we dislike mail villainous characters. I refer and point to Michael Burnham as a character in Star Trek Discovery. Fundamentally she's standoffish, cold, and sort of makes some pretty awful decisions. And unfortunately, myself included, I just don't really enjoy her character…and I want to. I want to like her, but the lack of character to me is just off putting. But yet we have similar male characters who are equally remote, and we have no problem with them… So why the difference? Anyway back to Pulaski, the author even states out right that she's abrasive, nonchalant to the point of appearing uncaring, and she comes off as someone who does her job for what it can bring her first. Even her first interactions with the Cardassians, I got a vibe of superiority. Really enjoying this book, the characters and political fallout from such an evolving society and those implications are so well described. We're really getting the sense that Cardassia is in the midst of great upheaval and change. Garak is fleshed out even more with each chapter… we learn great bit about how he does indeed have blood on his hands from his time in the Obsidian Order… which is the "section 31" for the Cardassians. Actually the Obsidian order is sited as being the most thorough and effective surveillance and spy agency in all of the galaxy. There's another great letter from Garak to Bashir, detailing his time when the Obsidian Order was dismantled, and he was no longer employed. After leaving DS9, he returned to Cardassia briefly, and found the ravages of the Jem'hadar attacks, and tried to salvage what he could. So lots of things go down… Lang is being framed we find out, or atleast suspect. She's fled and tried to go into hiding, but Garak catches up with her. He offers her friendship and protection actually. You see, Lang didn't actually have any hand in the Project Enigma experiments, but someone forged her name there. So if the motion to prosecute war criminals she would be responsible for it, and it'll ruin her career and possibly end her life. He aid is found dead and she takes up residence with Garak, who we don't know exactly why but he's motivated so far to protect her. We still don't know if Garak is responsible for the kidnapping of Antok and Pulaski. The formoer of which has vanished. Pulaski got out of the "prison" and has been picked up by Alden. Alden regrets trying to go toe to toe with Garak and may have done more harm than good. We dig deeper into the cufuddled mess and the political manveuring is thick. The author, McCormack does an excellent freaking job in keeping the identity of the captor and framer, a secret. Two chapters about how they have him in custody, and talking about him, and she's so sparse on the description/details, that we just don’t know! Or of course it could just be someone that we haven't been introduced to, which I admit would be a bit disappointing. The biggest event so far is the finally arranged meeting of Bashir and Pulaski. Garak arranged it, but it doesn't seem like something he happily agreed to. Bashir is described as having cybernetics implanted in him, and I assume it was to aid in any espionage work that was required of him. Wrapping up the story, I come away very very pleased. I'm a bit disappointed that we actually never got the reveal of just who the Section 31 agent was. It's stated that Alden was used to help extract the left for dead agent, but…we never ever know who he or she was. I mean I get the fact that this can be picked up in another book, but Star Trek books don't have the same tight knit continuity and regular release schedule as Star Wars books. This complete omission as to the identity of the agent, who kidnapped Pulaski and Antok, seems like it should have been atleast hinted at. I swore up and down that it was Bashir, but alas it's not the case. I then of course thought Alden..but no he was just used as a way to get to the agent… then was it gul Telek? And that's another thing, We're given this plot to kill or atleast scare Castellan Garak, but this mystery attacker, who turns out to be a victim of Project Enigma (which confirms that it did indeed happen), but unfortunately he's just sort of dropped on our laps. I don't think he was given any prior mention. So we're given all of these potential characters that could be involved in the kidnapping and murder of Lang's advisor…and it really seems like it's going to culminate in the reveal…and then nothing. in fact we're told the Cardassian authorities have the person! And then Section 31 seemingly extracts him from their custody..and still nothing! I actually had to go back and re-read a few chapters just incase I missed the reveal…but no it's all still a mystery. Now that being said, I can't even complain about this too much because literally it does leagues to create an air of unknown and of course support the cladestine nature of S-31. The last scene with Garak and Bashir is to me priceless. Since the beginning of writing this 'rolling review', I have learned a bit more about what happened and his involvement with Section 31… I really hope this is continued and allowed to play out. Seeing Garak turn into the role of caregiver to the doctor who did the same for him was very touching, and seeing him read to Bashir just so poetic (no pun intended). And of course that last moment where we see the twitching of his hand. As stated, I just really hope this is picked up and continued and not just left to dangle. I was a bit jarred by the character of Pulaski, as it was my first introduction to her, but by the end I really enjoyed her dry wit, brash personality and very unsubtle way of speaking her mind, sans filter. The opposite to me for Alden, He really never developed anything close to a personality and I just saw him as some plot device that was either going to betray Pulaski or turn out to be some double agent. While his involvement with StarFleet Intel does sort of point to this, it's never really shown but just referenced to at the end, lending even more to the pretty flat character. And of course Una McCormack does a splendid and noteworthy job with our simple tailor. Going into this I had thought Garak was a layered and Onion-esqe character.. by the end of it, I have no idea just how deep this rabbit hole even goes anymore. And it's never over the top, or just silly. Things happened in his career and he clearly made some dubious decisions, and what I love is that it's never really laid out on the table. A lot of it and his past are still left to our imaginations. Una revels in this, and keeps giving us peaks and nods as to what he has done in his Order days, and what not, but wholly, it's left up to us. So my biggest complaint I suppose is the mystery Section 31 character, and the fact that listening to the book, is great, but in the middle, during the talkative scenes, it can be a bit confusing as to who is chatting with who and their intentions and 'sides' do get a bit muddled. No fault of the author I think, but it definitely helped having the physical copy to go back and reference just who said what at times. Overall, as with Star Trek Headlong Flight and Hearts and Minds, I really really enjoyed this, and I would say if you are a fan of the Cardassian race and Garak…this almost is a must read. It goes very deep into Cardassian culture, philosophy and their current state of affairs and how they view themselves now. Una McCormack yet again has given us a window on Cardassia and Garak like no other, the book is beautifully written and flows flawlessly from beginning to end. You won't want to put it down so allow yourself the time required. Una McCormack has become the definitive expert when it comes to all things Cardassian for the relaunch novels a task she handles very well in her latest offering, "Enigma Tales". Set in the aftermath of "Star Trek: Section 31 - Control", we the reader return to Cardassia Prime where Katherine Pulaski is going to accept an award more deservedly for Dr. Bashir who is still comatose for solving the Andorian genetic problem. She herself is accompanied by Dr. Peter Alden formerly of Starfleet Intelli Una McCormack has become the definitive expert when it comes to all things Cardassian for the relaunch novels a task she handles very well in her latest offering, "Enigma Tales". Set in the aftermath of "Star Trek: Section 31 - Control", we the reader return to Cardassia Prime where Katherine Pulaski is going to accept an award more deservedly for Dr. Bashir who is still comatose for solving the Andorian genetic problem. She herself is accompanied by Dr. Peter Alden formerly of Starfleet Intelligence who just wants to see the sights. Castellan Garak is fighting an uphill battle against the military along w/ a report asking for the prosecution of Cardassian military officers who committed crimes against the Bajoran people at the end of the Occupation. We also have a sub-plot involving Elima Antok who discovers Project Enigma a secret project to purge all Cardassian/Bajoran hybrid children of their Bajoran heritage which implicates Natima Lang who is in the running for the head of the University of the Union's head job. Also between chapters we have letters that Garak is writing to Julian Bashir even though he knows that his friend may be lost forever. Structurally it's a bit loose, and the mystery has that problem where the resolution comes so quickly you miss it. However, of course it was a delight to revisit Garrak and Cardassia as seen by Una McCormack. This book deals particularly with the sensitive issue of half-Bajoran children, which of course we knew existed. Best parts: serious angsty Garrak-Bashir looooove that made my shipper heart twinge with delighted agony. Dr. Pulaski is a pure delight and a great character for adventure, always Structurally it's a bit loose, and the mystery has that problem where the resolution comes so quickly you miss it. Not giving it full marks, tho, because it just made me angry I hadn't read whatever books came before this one in what is obviously a series. So... gotta get on that. alternate title: Meanwhile on Cardassia. What does it take to get me to love a Star Trek novel? Give me a handful of interesting characters and have them do a handful of interesting things while having a handful of interesting conversations. 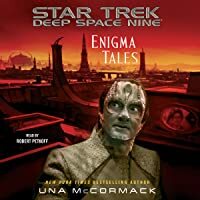 So as far as I am concerned, Una McCormack has hit the Trek Trifecta with Enigma Tales, the latest Star Trek: Deep Space Nine novel from Pocket Books. I found myself laughing out loud more times than I could count, absorbed by the plight of a post-Dominion Cardassia, and genuinely invested in the characters’ lives. The novel revolves around two major Trek characters, and it is to McCormack’s credit that she picks two of the most interesting ones, Dr. Katherine Pulaski, known to Star Trek: The Next Generation fans as the Chief Medical Officer on the Enterprise-D during Season Two of the series, and Elim Garak, perhaps the deepest, most fascinating character Trek has ever produced, who was a regular on Star Trek: Deep Space Nine and is, at the time of this novel, the castellan (chief executive) of the Cardassian Union. McCormack draws these characters, with all of their prickliness and conflicts, with exquisite care. Pulaski leaps off the page to wrestle the reader with her characteristic frankness, and Garak – oh, Garak! – struggles to become a new man, leading a new society, amidst all the temptations of power. Dr. Pulaski, arriving on Cardassia Prime to receive a humanitarian medal for helping to avert a medical crisis among the Andorians, is drawn in to a political and social crisis as one of Cardassia’s most honored leaders, Dr. Natima Lang (DS9: “Profit and Loss”) becomes accused of complicity in horrific war crimes against Bajorans during the Cardassian occupation of Bajor. Is Lang guilty, or is Castellan Garak orchestrating the accusations to destroy her reputation? Enigma Tales explores the challenges of life in an emerging democracy struggling with freedom of the press. McCormack has studied post-war European history in great detail, and her depth of knowledge gives this story resonance and meaning. And Garak – oh, Garak! The torturer for the Obsidian Order, turned “plain and simple tailor,” turned freedom fighter and now planetary leader fights to keep his soul clean when his instincts and training offer him the temptation of dark expediency. Before each chapter, we read an unsent letter from Garak to his beloved friend, Dr. Julian Bashir, who is still recovering from the events in David Mack’s Control. And the letters are lovely, and heartbreaking, and insightful. Between Garak’s exploration of Cardassian geography and Dr. Pulaski’s exploration of Cardassian culture, Enigma Tales dares you to fall in love with one of Star Trek’s most vilified peoples. There are other characters in the book, too. We meet Dr. Pulaski’s colleague Peter Alden, a former agent for Starfleet Intelligence, now working as a researcher aboard Pulaski’s starship, Elima Antok, a Cardassian historian with a secret, and an assortment of other Cardassian citizens, none of whom comes across as a stock character, and all of whom have interesting roles to play. And Garak quotes The Hitchhiker’s Guide to the Galaxy. So, what more could you want? Star Trek: Deep Space Nine: Enigma Tales by Una McCormack Just as a report about war crimes during the occupation of Bajor is published on Cardassia, Pulaski and Alden come to visit - and are embroiled in internal politics, kidnapping and the attempt at defamation of Natima Lang, the next hopeful for head of the Cardassian Union's university. I love McCormack's Cardassia, it's rich, well-nuanced, and her Garak is to die for, pure and simple. 15 years have passed since the end of the Dominion War Star Trek: Deep Space Nine: Enigma Tales by Una McCormack Just as a report about war crimes during the occupation of Bajor is published on Cardassia, Pulaski and Alden come to visit - and are embroiled in internal politics, kidnapping and the attempt at defamation of Natima Lang, the next hopeful for head of the Cardassian Union's university. I love McCormack's Cardassia, it's rich, well-nuanced, and her Garak is to die for, pure and simple. 15 years have passed since the end of the Dominion War and Cardassia is on a good way to becoming a lasting democracy. One important step is facing its own role in past events, like the occupation of Bajor, and its consequences - in this case putting criminals on trial. But the situation is still unstable enough that accusations against a popular figure might put democracy as a whole in danger. And this knife's edge comes through beautifully. However, ultimately, as long as Garak's in power I simply don't quite see any serious threat to Cardassia's fledgling democracy. He's too vigilant and circumspect - but after his term, I guess all hands are off. For we know a young democracy is most in danger of falling back into old authoritarian patterns when people begin to feel safe and stop paying attention. Garak's own position is, of course, rather unique; he was a member of the Order back on Bajor, did his own share of criminal acts, has always frowned upon democracy and the rule of law - but keeps steering Cardassia on the right path. Of course, he has his agenda, of course, he keeps secrets, and I think Garak wouldn't be Garak if he didn't, but he's the one character who has changed most consistently throughout TV and treklit, and having him as the strongest supporter of democracy now feels right and true. One thing I find really extraordinary is how drawn he seems to be to doctors, as in Parmak, as in Bashir who have always acted as some sort of moral compass for him. Just one thing: How long is the castellan's term? And can't Garak be reelected for another term? As for Bashir: Since I haven't yet read "Section 31: Control" I don't know what happened there, but just the few little scenes (the last one with Garak especially moving) have moved that novel up quite a few spots in my to-read list. As much as I love McCormack's portrayal of Cardassia, I really can't relate to her Pulaski who smells conspiracies and shows prejudice whereever she goes. She's annoying as hell, and even if she doesn't care about diplomacy she's old and experienced enough to realize when to speak and what to say (and in what way). So her blunder with Garak and the media is a bit tiresome. But I like Alden - so he should keep popping up in McCormack's novels, but please spare me Pulaski! Overall, another solid entry about Cardassia - nowhere near Never-Ending Sacrifice or Crimson Shadow, but still an entertaining glimpse into Garak's reign as castellan. Continuing in the Star Trek Deep Space Nine relaunch universe is Enigma Tales. As you'd guess, this book is situated on Cardassia immediately following the previous title, Section 31 - Control. We join Dr. Pulaski in touring the capital city on a trip to get an award, meanwhile we follow Garak, sorry, Castellan Elim Garak, on his efforts at rebuilding a Cardassia that isn't an authoritarian surveillance state ran by the military. In this book, we get a chance to read about how the capital has ch Continuing in the Star Trek Deep Space Nine relaunch universe is Enigma Tales. As you'd guess, this book is situated on Cardassia immediately following the previous title, Section 31 - Control. We join Dr. Pulaski in touring the capital city on a trip to get an award, meanwhile we follow Garak, sorry, Castellan Elim Garak, on his efforts at rebuilding a Cardassia that isn't an authoritarian surveillance state ran by the military. In this book, we get a chance to read about how the capital has changed, the brutality of the final moments of the Dominion War (Locals refer to those final moments as "The Fire"), and how the people have changed and are more accepting of others and their past. I really enjoyed this book, in fact, I wish there were more novels set on post-war Cardassia Prime. As you would expect, Dr. Pulaski's personality is upsetting people, especially the Castellan, and causing her handlers and traveling companions a number of issues. At the beginning of every chapter, there is an unsent letter to Dr. Bashir, who is still on Cardassia, where Garak goes into his reflections on the new Cardassia. These are quite touching, especially when he explains to his friends how he views Dr. Bashir. We also get to see what became of Dr. Natima Lang (See DS9 episode "Profit and Loss" and novel "This Gray Spirit") and what Garak thought of her and her future prospects. 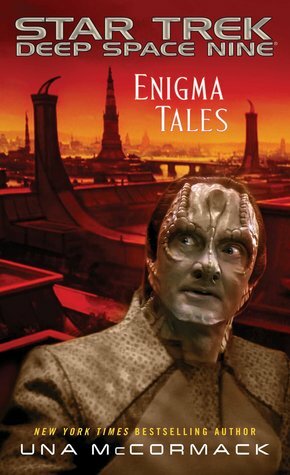 Enigma Tales is a well paced book and is one of my favorites in the DS9 relaunch series. I swore I'd never read another one of these again. I don't know how bad novelizations of other TV shows are because after reading a sack full of Trek novels, (mostly TNG) I swore off the damn things and I've never been tempted by Dr. Who or Blake 7 or even Star Wars. But every now and then I get the itch to try again. it usually ends badly in self disgust. Not this time. Enigma tales is pretty good for any space opera Sci/fi book, and a frigging masterpiece for a Trek book. this book is set 15 years I swore I'd never read another one of these again. this book is set 15 years after the Dominion have tried to exterminate the Cardassian people in the last days of the Dominion war. It takes place entirely on Cardassia Prime with only a few Federation characters. What we get is a more intimate story about people coming to grips with the past. Both old and new characters wrestle with guilt and trauma and try to define what they want the future to be and how to get there. Enigma Tales contains a lot more subtlety, insight and empathy than I have come to expect in any Star Trek novel. I have to tip my hat to Uma McCormack for including many elements from "Stitch in Time" the book by Andrew Robinson (another rare great Trek book) regarding the post DS9 experiences of Elim Garak. well done Uma. Another Nice touch was showing Star Fleet is not infallible no matter how well intentioned. Although they are trying to help they are not free of prejudice or suspicion. This was a good Cardassian plot idea and the Cardassian characters and setting were true to form. The pace was nearly glacial in places, but I was fine with that--the story was mostly about the characters. That said, the story didn't need the othering/exoticizing gaze of Pulaski & co. You could delete nearly every single one of the Federation characters and nothing significant would have changed in the plot. Limiting your POV to a handful of Cardassians--or just Elima, for that matter--would This was a good Cardassian plot idea and the Cardassian characters and setting were true to form. The pace was nearly glacial in places, but I was fine with that--the story was mostly about the characters. That said, the story didn't need the othering/exoticizing gaze of Pulaski & co. You could delete nearly every single one of the Federation characters and nothing significant would have changed in the plot. Limiting your POV to a handful of Cardassians--or just Elima, for that matter--would have allowed for more depth where it mattered, possibly getting us to more action and less talking about action (as the various moving parts are informed of the same things, over and over again). Enigma Tales is the perfect title for this story, which is partly about the way that everyone is guilty of something. It's ALSO about hope, and rebuilding life in the face of trauma; not only how difficult that can be, but how that means culture, not just buildings and services. It's about love. It made me laugh, as well as make incoherent wailing noises. It's a book I plan to re-read when I have recovered enough emotionally. If you do not believe this is possible from a Star Trek novel, then you Enigma Tales is the perfect title for this story, which is partly about the way that everyone is guilty of something. It's ALSO about hope, and rebuilding life in the face of trauma; not only how difficult that can be, but how that means culture, not just buildings and services. It's about love. It made me laugh, as well as make incoherent wailing noises. It's a book I plan to re-read when I have recovered enough emotionally. McCormack deftly and imaginatively expands upon the Cardassia we get in DS9, diving deep into their cultural conflicts and academic pursuits. The novel ends a bit disappointingly, and the plot does not move mountains. But the view of daily life on Cardassia Prime is priceless, as is McCormack's characterization of Garak and her almost-frank approach to his sexuality and his romantic love for Julian Bashir. A Star Trek novel featuring Dr. Pulaski and Garak as the main characters surprised me, but I quite enjoyed it. Garak is one of my favorite characters in general. I think Dr. Pulaski is an underappreciated character and this story was a good use of her somewhat cantankerous personality. I really liked getting a look at Cardassia's post-war society and their collective reflection on their dark past.